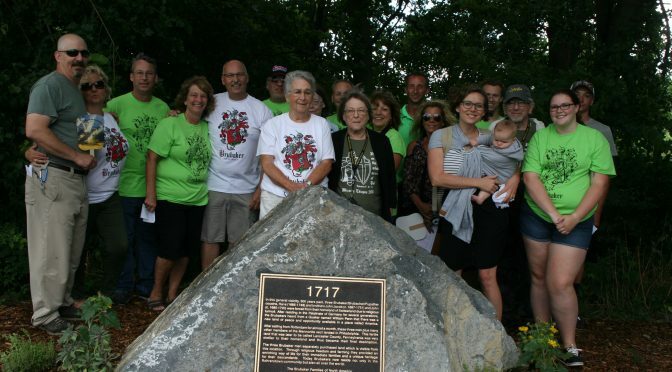 A dream that was in the works for eight years became reality on the morning of August 5th ,2017 as the official dedication of the 300th Anniversary plaque and monument took place at Noel Dorwart Park in East Hempfield Township on Brubaker ancestral lands purchased from William Penn in the latter part of the year 1717. On a comfortable sunny and breezy morning following overnight storms, the ceremony began at 9:30 am. Led by Mistress of Ceremonies Lori Burkholder of WGAL-8 (who also is a neighbor on a small farmette carved out of the original “B” family line farmstead), the event included a Presentation of the Colors and Pledge of Allegiance led by Boy Scout Troop 64, Cub Scout Troop 125, and Daisy/Brownie Troop 71450. Also, singing of the National Anthem led by Brubaker cousin Lamar Dourte, and remarks were made by local officials and local dignitaries. An opening prayer was offered by the Reverend Milt Gockley of the Church of The Apostles United Church of Christ. It should be noted that the Church of the Apostles and Homestead Village Retirement Community were the purchasers and beneficiaries of the original “A” family line homestead and farm, located just a few hundred yards south of this monument site. After opening Welcome remarks by East Hempfield Township Supervisor Doug Brubaker, former PA 36th District Senator Mike Brubaker offered remarks. Then PA 41st House District Representative Brett Miller spoke and presented a Citation by the PA House of Representatives to the Brubaker Families of America in commemoration of this milestone. Rolando Santiago, Executive Director of the Lancaster Mennonite Historical Society (and a nearby neighbor) then spoke for several minutes. The Colors were retired by the Scouts, and then it was time for the long-anticipated moment: the unveiling of the monument. Lamar Dourte led in the singing of “God Bless America” while cousins Eileen Johns and Bob Noll (both 8th generation descendants of “A” family line ancestor and immigrant Hans Brubaker) walked together to the covered monument and unveiled it. Almost 200 people witnessed this very special event, one that many will remember for a long time. Enjoy the images below from the ceremony.